Apple on Wednesday released iOS 4.3.3 for the iPhone, iPod touch and iPad, addressing issues related to location data stored in a database file on devices running iOS 4. Apple quickly released the update in response to growing concerns over the "consolidated.db" file that gained attention in recent weeks. The issue gained so much attention, in fact, that Apple was forced to issue a statement on the matter a week ago. Deletes the cache entirely when Location Servcies is turned off. 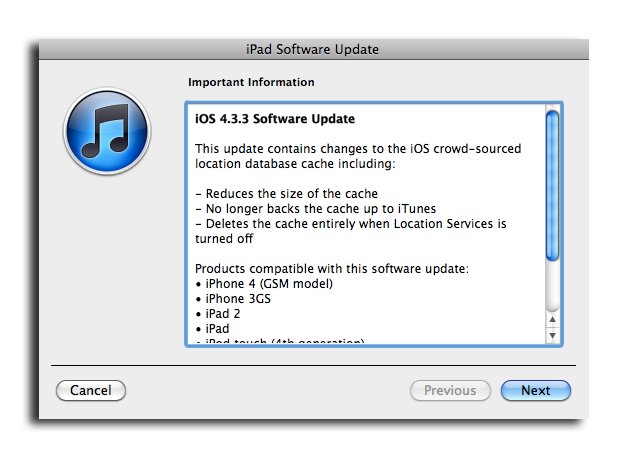 The iOS 4.3.3 update is available now through iTunes. It applies to the GSM-based iPhone 4, iPhone 3GS, iPad 2, iPad, and third- and fourth-generation iPod touch. Also availble is iOS 4.2.8 for the CDMA iPhone 4. Apple promised last week that the location database issues would be addressed in a software update in a matter of weeks. But the company acted quickly to release the iOS update, making it available just a week after the company publicly spoke out on the matter. The update aims to calm growing concern over a bug in iOS 4 that stored a database of up to a year's worth of Wi-Fi hotspot and cell tower locations. Apple said they don't think the iPhone needs to store more than seven days worth of such data. The company admitted that the data should not be collected when users turn off Location Services on their iPhone, and the fact that it was being stored was a bug. Apple also promised that its next "major" iOS software release would encrypt the file on the iPhone, ensuring that the data could not be obtained by a third party for illicit purposes. Before Apple spoke out on the issue, it prompted lawsuits, government investigations around the world, and a scheduled hearing on mobile privacy in the U.S. Senate, set to involve both Apple and Google on May 10. The issue gained attention after two security researchers publicized their findings related to the "consolidated.db" file stored on the iPhone. Though the file created by iOS 4 is not sent to Apple or anyone else.